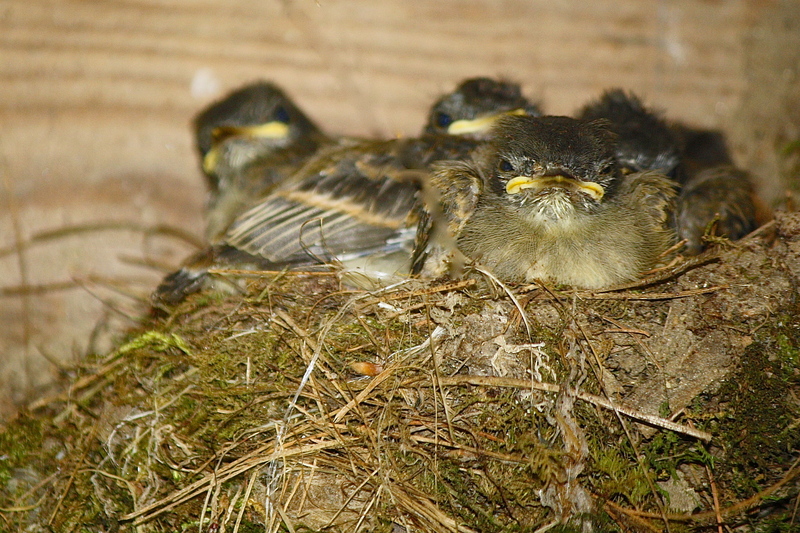 This entry was posted in Field Notes, My Photos and tagged baby birds, birds, Eastern Phoebe, fledglings, nature photography, nestlings, Sayornis phoebe, Wordless Wednesday. Bookmark the permalink. Oh, Just love this one!! Aren’t they? Any day now, they’ll fly away – I’m gonna miss them! That they are, thanks so much! Don’t little birds always look like they just need a nap when their mouths are closed? All they do is eat voraciously and snooze in the minutes between parent visits. And boy, are those parents busy! 🙂 Cheep, cheep! they call all day long! Whew! Aw, so cute Eliza. I love goofy little baby bird mouths. Oh, ouch, it is so hard to lose these precious ones to predators, domestic or otherwise. Now that my cats stay inside, I feel the birds are much safer, but I still have to watch out for the neighbors cats. I’m hoping these little guys make it to adulthood! Thanks, Fi. Hope you enjoyed your holiday! What a charming picture, Eliza. I’m finding half-eggshells all over the yard, but I’ve seen no baby birds. We have a pair of mourning doves tending a nest high up in the eaves of the house. I’ve left a big tub of water nearby for the parents. Good for you! I can imagine providing water for the birds out there would make a huge difference and attract many takers. I haven’t heard a single cheep. That would be so sweet! You’re right about providing water in this weather – I haven’t actually seen either mourning dove drinking at the water gift; just a few sparrows (I think). Most people have the sense not to water lawns during the day, so there’s very little “free” water throughout the day. Although, I’m sure they know lots more than I about where to find it.